There’s been a lot of web chatter about the Dallas Morning News article by Wayne Slater about Wendy Davis. Wendy’s apologists/fans call it a right-wing hatchet job. Her detractors call it proof she’s a liar. That conversation can go on til election day with both sides entrenched. The point many seem to miss is that the most damaging evidence against Ms Davis is a video produced by her campaign and narrated in her own voice. The video pushes the personal narrative on which Wendy has based her campaign, her personal pulled-myself-up-by-the-bootstraps Texas success story. The video let’s us know that Wendy was a down on her luck 19 yr old teen working mom who miraculously managed to work her way thru TCU and Harvard and become a success. It unfortunately omits the fact she remarried and her hubby paid her way thru both schools while keeping the kids so she could go. Watch the video. Tell me you don’t get the message she worked her way thru college and Harvard as a single mom. Wendy made her bed with a self-agrandizing but false narrative. Texas voters will bury her in it. She based her campaign on her personal saga, and chose to push a lie. Truth would have been sufficient, but she wanted to sound more heroic. Texas voters don’t like politicians that play false credentials. Ask Lena Guerrero. Only way Wendy will get into the governor’s mansion will be to take a guided tour. Previous Post When did Cartman become a New Mexico cop? 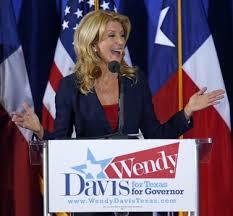 Next Post “Attacks” on Wendy Davis Sexist? The old girl flat stepped in it, this much cannot be denied. What is amusing is, after hoisting herself on her own petard, watching her desperate efforts to blame this on her opponents. The Good Book advises us that “ye shall know the truth, and the truth shall set you free.” The sad part of the story is that there will be, of course, those who ignore the truth for political expediency and vote for her anyway. For an example of this phenomena in action, I give you Sheila Jackson Lee. True, but Sheila was elected by a district in Houston, not a statewide race. Wendy was a longshot. She wasnt ready for primetime, as illustrated by a narrative heavy campaign based on a narrative that was a lie. Now she will dwindle to a NO-shot. Even Hillary is chipping at her armor now.